MARITIME REPORTER and Engineering News, 118 East 25th Street, New York, NY 10010. Must be able to assume the responsibility of direct- ing the overall activites of an engineering depart- ment with a staff of 20 to 30 professional, technical, and clerical people. All replies kept strictly confi- dential. Total compensation package up to $60,000 per year. Minimum requirements: Relevant engi- neering degree, 5 years Industrial Sales experi- ence, fluency in English and German. License—Diesel. 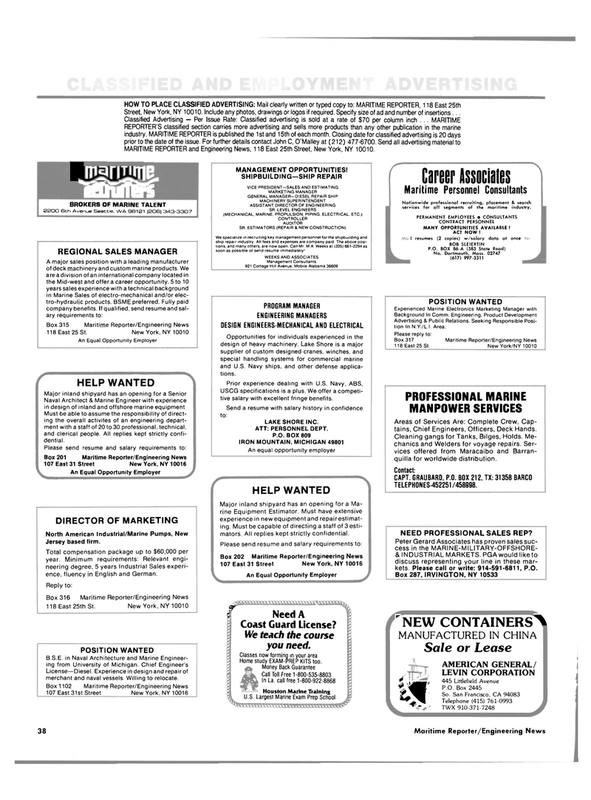 Experience in design and repairof merchant and naval vessels. Willing to relocate. Opportunities for individuals experienced in the design of heavy machinery. Lake Shore is a major supplier of custom designed cranes, winches, and special handling systems for commercial marine and U.S. Navy ships, and other defense applica- tions. USCG specifications is a plus. We offer a competi- tive salary with excellent fringe benefits. Major inland shipyard has an opening for a Ma- rine Equipment Estimator. Must have extensive experiencein newequipmentand repairestimat- ing. Must be capable of directing a staff of 3 esti- mators. All replies kept strictly confidential. We teach the course you need. Home study EXAM-PREP KITS too. Nationwide professional recruiting, services for all segments of the placement & search maritime industry. Advertising & Public Relations. Seeking Responsible Posi- tion In N.Y./L.I. Area. Box 317 118 East 25 St.
Areas of Services Are: Complete Crew, Cap- tains, Chief Engineers, Officers, Deck Hands. Cleaning gangs for Tanks, Bilges, Holds. Me- chanics and Welders for voyage repairs. Ser- vices offered from Maracaibo and Barran- quilla for worldwide distribution. Peter Gerard Associates has proven sales suc- cess in the MARINE-MILITARY-OFFSHORE- & INDUSTRIAL MARKETS. PGA would like to discuss representing your line in these mar- kets Please call or write: 914-591-6811, P.O.